In a stunning upset, Hunter Tootoo of the Liberals grabbed the Nunavut seat in the House of Commons from Conservative incumbent Leona Aglukkaq Oct. 19, riding a national tidal wave of support for Justin Trudeau’s Liberals. “Tonight I’m very proud of our country, I am privileged to have the opportunity to represent Nunavut and be your voice in Ottawa,” Tootoo said in a speech to supporters in Iqaluit. Before polls closed Monday evening at 9:30 p.m. eastern time, Tootoo’s supporters had already made their way through the windy night to the Elks Lodge in Iqaluit to follow national coverage of the federal election. By 8:30 p.m., Liberal partisans watched their party sweep the Atlantic provinces, but would the “red wave” reach Baffin Island and continue west to unseat veteran Conservative incumbent Leona Aglukkaq? After 9:30 p.m. eastern time they got their answer. Tootoo and his campaign staff were recording victory after victory on a list of Nunavut community polls posted on the wall. And when Tootoo won the poll in Aglukkaq’s former hometown of Cambridge Bay, where she began her political career as a hamlet councillor, it was a certainty — Nunavut had a new MP. The crowd erupted in applause for Tootoo, drowning out Stephen Harper’s concession speech on the big-screen TV, in which Harper acknowledged the national victory won by Prime Minister-elect Justin Trudeau, whose Liberal party took a majority of seats in the House of Commons. CTV’s election website at the end of the night showed Tootoo finishing in first place with 5,618 votes, 47.2 per cent of votes cast in Nunavut, well ahead of the New Democratic Party’s Jack Anawak, who clung to second place with 3,153 votes or 26.5 per cent, and Aglukkaq, who finished third with 2,956, or 24.8 per cent. Spencer Rocchi of the Green party ended up with only 183 votes, 1.5 per cent of total votes cast. Trudeau’s Liberals will form a majority government after a stunning national result that saw them take at least 184 seats, compared with 99 for the Conservatives, 44 for the NDP, 10 for the Bloc Québécois, and one for the Greens. Nunavut Premier Peter Taptuna congratulated Tootoo and Trudeau in tweets, saying he looks forward to working with the new Trudeau Liberal government. The new MP-elect for Nunavut thanked the other candidates for running a competitive race. “We all have differences, opinions, and belief — that’s what the campaign is for. But I think we all agree we want Nunavut to succeed in a stronger Canada,” he said. And Tootoo didn’t lose his sense of understatement after his victory. “I guess I’ll get a call from Ottawa tomorrow,” he told Nunatsiaq News after posing for a group selfie with family and supporters. The defeated Conservative incumbent, Leona Aglukkaq, watched the election unfold privately at her residence, but in a written statement to Nunatsiaq News she offered Tootoo her congratulations. “I am proud of what I have delivered. 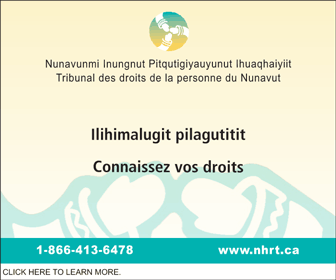 I am proud that for the first time Inuit Qaujimajatuqangit is being used and incorporated at the federal level, this is something I fought for and I hope will continue,” Aglukkaq said. “Each community and each one of us is different in our struggles and our triumphs, but it is because of the people in Nunavut, that we will overcome any challenge before us. 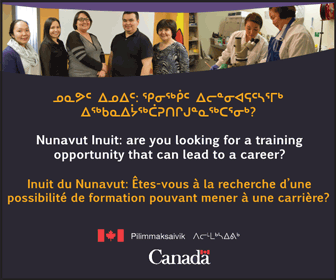 I am confident that Nunavut is on the right track and if we continue to invest in our people first, we will build even stronger and healthier communities,” she said. “As I begin the next chapter of my life, I want to say thank you to the countless people who have enriched my life over the past seven years — none of this would be possible without you,” Aglukkaq’s statement said. At the beginning of the longest election campaign in Canadian history, Aglukkaq was a heavy favorite to reclaim the Nunavut riding. But in the final weeks both Tootoo and New Democrat Jack Anawak likely made solid gains on the Conservative incumbent —aided by visits from their respective party leaders, Justin Trudeau and Thomas Mulcair. “Tonight along with our leader and new prime minister we celebrate victory, tomorrow we will bring new change to our country,” Tootoo said to close out his victory speech.